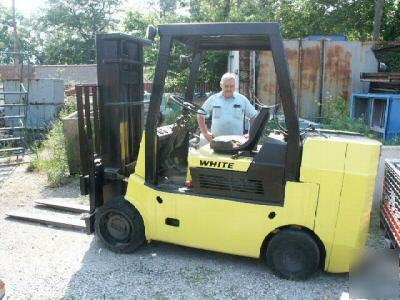 White Forklift from White Motor Corp.
*This forklift is used, but it has been reconditioned. It was completely checked by our mechanic and is in good working condition. Tires are a little rough, because this was used in a large plant but they still ride fine. ~Total truck weight: 15,780 lbs.